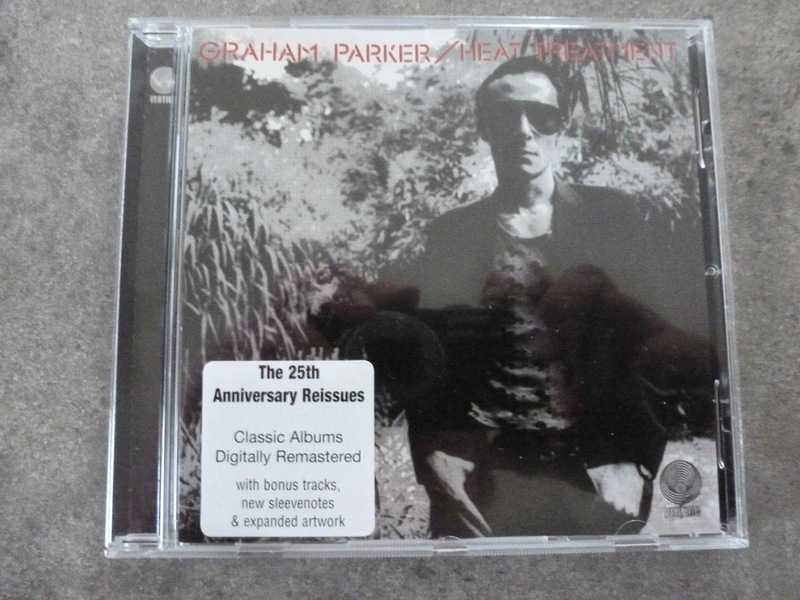 The Little House of Concrete Music: Graham Parker "Heat Treatment"
Coming less than a year after the debut album, you couldn’t help suspecting there are issues with the material, but when you’re talking something as strong as Fool’s Gold, that’s not an issue. It’s very much a more of the same exercise, with Parker’s impassioned vocals leading the way as The Rumour does a mighty job of matching The Band’s example in the ensemble playing department. A little more time might, of course, have been helpful when it came to assembling the material, but of the original ten tracks (the 2001 remaster tacked The Pink Parker EP’s Hold Back the Night and (Let Me Get) Sweet on You onto the end) the only two that might have been liable for the chop were Something You're Going Through and Help Me Shake It. The relevant Wikipedia article cites Parker’s reservations on on one of his least favourite recordings, due to inexperienced vocal technique, rushed songwriting (see above), and stiff production by Robert John "Mutt" Lange who’d been slotted in by the record company instead of Nick Lowe, who’d looked after production duties on Howlin’ Wind. Lange was still new at the production caper, with a handful of credits (Richard Jon Smith, City Boy, Kevin Coyne and Mallard, drawn from Captain Beefheart’s Magic Band) but went on to significant success (Supercharge, The Motors, The Boomtown Rats, The Records, AC/DC, Def Leppard, The Cars, Michael Bolton and Shania Twain) so he must have been able to get some things right. But, despite the fact that he sat in the chair for the first album by The Rumour (1977’s Max) he may not have been the best man for this job. That’s fairly obvious when the horns kick straight in at the start of Heat Treatment, three and a bit minutes of impassioned R&B that doesn’t swing the way White Honey does at the start of Howlin’ Wind. The critics didn’t seem to mind all that much, though, and when the Village Voice compiled the critics poll of the year's best albums Heat Treatment finished second, with Howlin’ Wind coming in a very respectable fourth. Not as much swing, but there’s definitely a bit of arrogant swagger in the Dylanesque putdown of an old lover in That's What They All Say, and while things drop back a notch for Turned Up Too Late, there’s a fairly withering assessment of a failing relationship in a cutting lyric in a song later covered by the Pointer Sisters. Howlin’ Wind started with an upbeat and swinging White Honey, but Black Honey here is a dark, downcast, desolate outpouring of soulful emotion in bitter lands where the singer’s a face without a voice. Great melodic guitar work from Brinsley Schwarz, though. Your mileage might vary when it comes to Hotel Chambermaid, depending on how you read the randy rooster strut. If you’re cool with that sort of thing you’ll find it spirited and celebratory, but I’m inclined towards the shuffle button. Sexist throwaway for mine, and reminiscent of a certain French politician from a few years back. On the other hand, Pourin' It All Out is an anthemic statement of what Parker’s all about, a mission statement if you like. And while Hotel Chambermaid, for mine, borders on the ugly, Back Door Love delivers a lighthearted strut that’s close to irresistible with a string of interesting rhymes at the start and stereo metaphors in the middle. Something You're Going Through, on the other hand, along with Help Me Shake It, is a little too close to by the numbers proceeding through the motions. Two that mightn’t have made the cut if Parker and company hadn’t been in such a hurry. Just about anything off Stick to Me would have been a perfectly acceptable substitute for either. But there’s no questioning the quality of the album’s concluding number. The anthemic Fool's Gold has Parker vowing to keep searching for perfection. He’s probably talking about a woman or a relationship, but you can apply the theme and the lyric to almost any search you know to be impossible, or likely to be regarded with a scratch of the head by friends and acquaintances.. The 2001 remastered reissue tacks two bonus tracks from The Pink Parker EP after Fool’s Gold, a spirited cover of the Trammps’ Hold Back the Night and Parker’s (Let Me Get) Sweet on You which swings enough to have slotted nicely onto the first album. Pleasant enough ways to pad out the length and persuade someone to shell out for the reissue, but a slight letdown after that magnificent closer. Coming back to an old favourite after a long time doesn’t always work out the way it should, but here, having worked my way through Howlin’ Wind several times before progressing to the next, it’s obvious that advances had been made, both in terms of the writing, which has progressed towards what was to come later (Squeezing Out Sparks) and the playing, which I suspect, reflects a more collaborative approach between writer and band when it comes to arrangements. The sound is a lot fuller, and there’s a level of aggression that wasn’t there in Howlin’ Wind, which sounds subdued by comparison. At this point Parker's still a relative novice at the songwriting caper, but there’s an increasing confidence that ties in with a degree of conviction that stood out like a beacon among the overblown likes of post-Atlantic Crossing Rod Stewart. He provided a template that was picked up and modified by the likes of Elvis Costello and Joe Jackson and, by the end of the second album, it’s close to fully formed. There was, of course, still room for refinement.